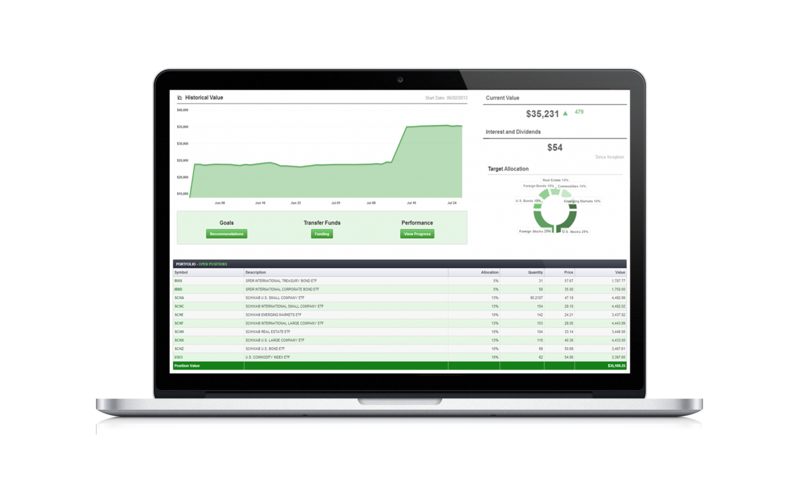 Chrisilis gives you an intuitive snapshot of your investments to help you keep up with your financial goals. The first screen in our secure client portal, the Dashboard is designed to give you an instant understanding of your account. The Current Value, Historical Value chart, and inception-to-date Interest and Dividends give you a quick, visual update of your wealth. Below the chart, clients can see their portfolio holdings and their respective values. A detailed breakdown is just a click away in the Performance section. We pride ourselves on diversification and the inclusion of asset classes often reserved for more “complex,” high net-worth portfolios. Exchange Traded Funds (ETFs) have opened up the door to allow these comprehensive portfolios in accounts of all sizes. 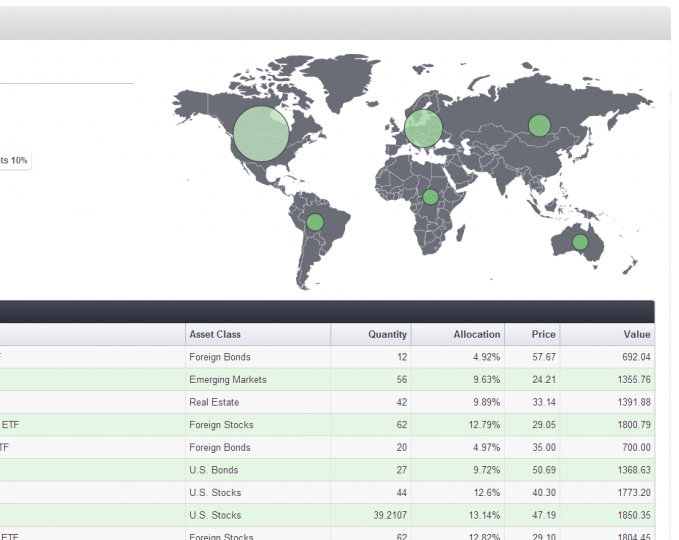 You can quickly visualize the diversification and global reach of your portfolio from the Allocation page. 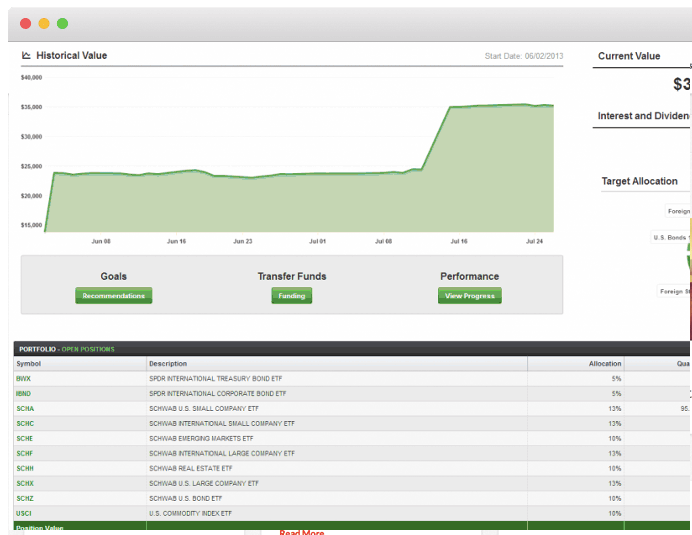 You can also see the specific percentage and ETFs we use to build your portfolio. On this page, you can also request a change to allocation. These requests should be based on changes in your investment objectives, risk tolerance, financial situation and timeframe. Please notice these are not emotional decisions based on Fear or Greed, nor changes based on our predictions of the market. These types of changes consistently FAIL investors. Tracking your portfolio has never been easier! 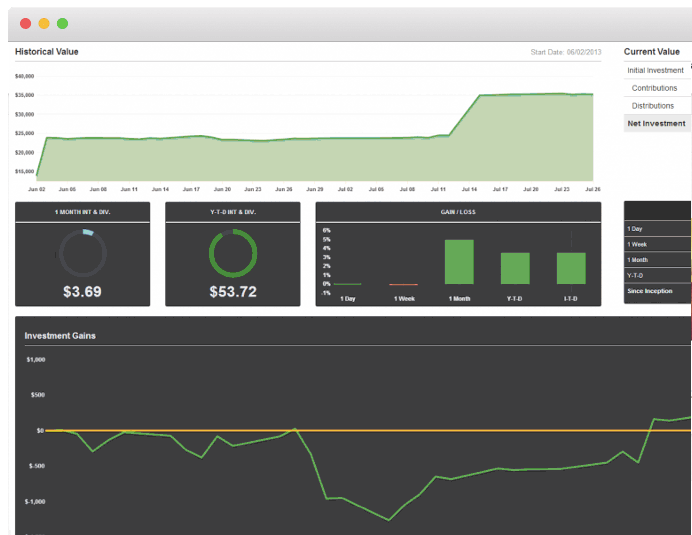 Our Performance page will give you a great visualization of your portfolio’s performance from ALL angles. With performance displayed in both charts and tables, each investor can quickly find the information needed to answer their questions about recent and long-term performance. Performance is usually the top concern for all investors. First, it is important to consider your performance in context of the level of risk in your portfolio. We seek to reduce the risk through diversification in multiple asset classes and using passively managed ETFs. Also, we optimize that approach by reducing the investment expenses to the minimum. At times this creates a “boring” approach to investing. But historically this has proved to be the most successful. Your hard earned wealth and savings is not something to gamble with. Our plan will provide simple, actionable steps you can take to improve your financial well-being. Saving money in the right account, investing wisely, and insuring against risks are all addressed in our simple to complete financial plan. You do not need a 20-page document to tell you the next step to take to improve your financial future. Our 5-Minute Financial Plan will put you on track for success. Our focus on the Funding page is a demonstration of our “Save First” mentality. Regular deposits and savings is one of the greatest ways to improve your chances of a financially stable retirement. The successful achievement of any goal will be a combination of factors: investment returns, a wise budget, and consistent savings. 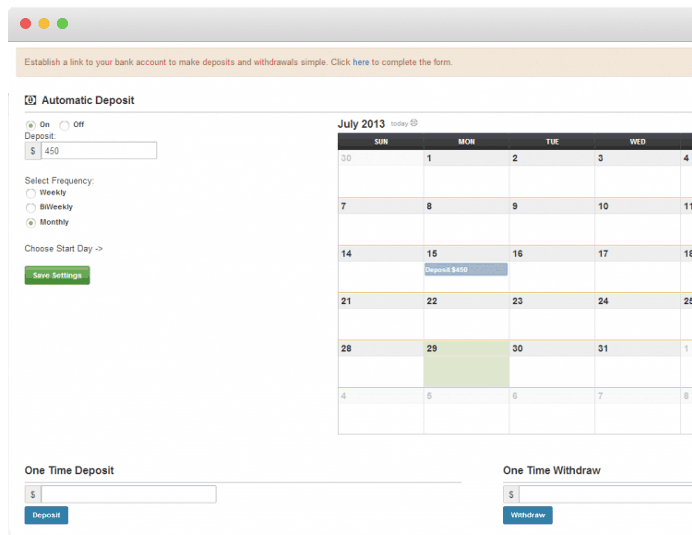 Whether it is an annual IRA contribution or small weekly deposits, the Funding page will allow you to set up your exact deposit schedule. From there, we will automatically invest the funds when they arrive in your managed account so they never sit idle not working for you. Everyone will have retirement as part of their financial plan. Some want to get there as soon as possible, while other say they’ll work until the day they die. In either case, planning and saving for the future is a must. Employees can no longer rely on their employers to pay a pension or cover healthcare costs. Even the government’s support through Social Security and Medicare is a question for the youngest generations. The responsibility of saving for retirement has shifted to each and every one of us. 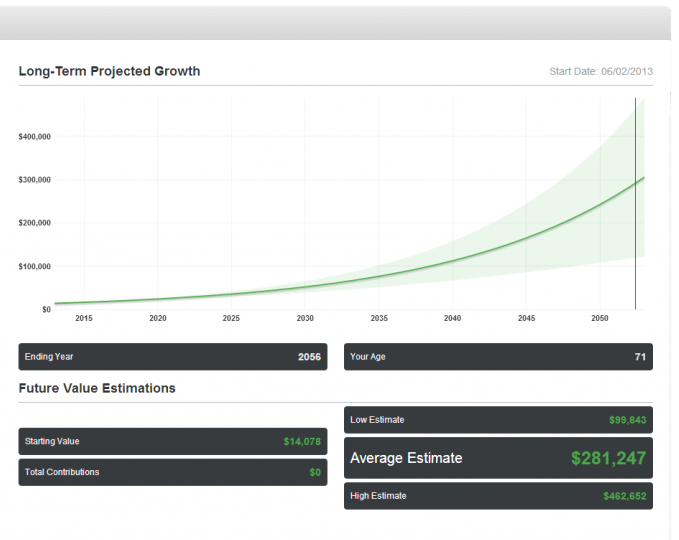 This page will help visualize growth until retirement, and then distributions when you are no longer working. 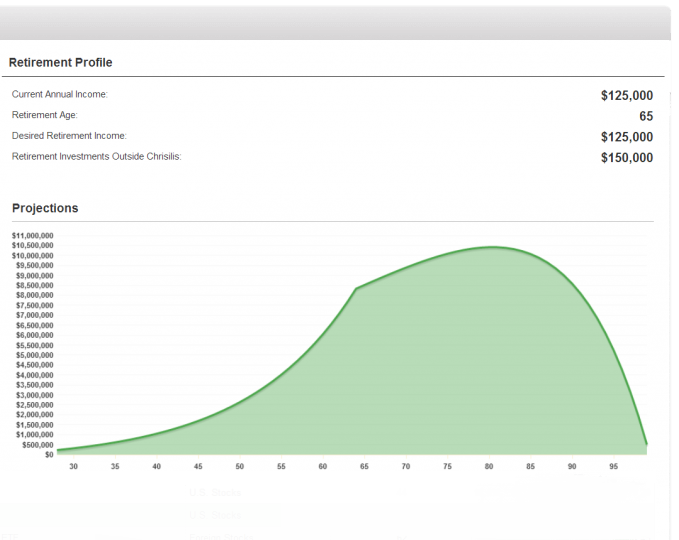 It will also estimate income possibilities from your portfolio and the savings necessary to meet your income needs when work over. As we mentioned along with our Future Estimations, our calculators are just estimates and past performance is no guarantee of future results. However they can guide you in your financial planning for the future.